Poppy, acoustic, alt-rock-influenced originals. Possibly the world's first acoustic guitar-vocal / trombone-euphonium duo. Haruka Wada delivers her poppy, alt-rock-influenced originals with an acoustic guitar and a pleasantly unforced voice, while at times her lyrics strike an edgier tone. 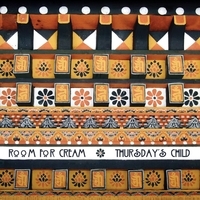 Her husband John “Showtime” Janowiak (leader of Soulio, and a former long-time member of Liquid Soul) is a trombonist known for punchy jazz-funk improv, but in Room for Cream he brings out his more melodic side. Here their worlds blend to form a refreshing musical brew. The guitar-vocal / trombone-euphonium duo: Has it ever been done before? On “Thursday’s Child,” Haruka complements her originals with covers by Veruca Salt ("Benjamin"), Eels ("Manchild") and Sarah Jahn ("Crucible"). Reflecting on her childhood in Japan, she also covers the ‘70s pop hit “Iihi Tabidachi” in her native Japanese. Percussionist Kalyan Pathak and bassist Greg Nergaard add extra spice on several tracks.